I'm currently doing an oral history project on my university's LGBT population and have run into some interesting challenges. Older people (50+ years) requiring pseudonyms. My IRB approval required several hoops to be jumped through (such as no 3rd party names are to be listed in the transcripts and my tapes are to be destroyed) to ensure strict confidentiality. I'm completely ill about this and although I disagree with IRBs being required for oral histories philosophically and my particular requirements, I want to graduate and my thesis adviser required me to do it too. There is a case to be made for blanking out the names of third parties; I regard this as an ethical question yet to be sufficiently explored. The National Human Research Protections Advisory Committee's "Clarification of the Status of Third Parties When Referenced by Human Subjects in Research" is not particularly helpful. It states that researchers don't need informed consent from third parties, but does not explain how they should regard those parties' privacy. The demand to destroy tapes, in contrast, is just wrong. Tapes can be sealed for decades; historians are patient folks. 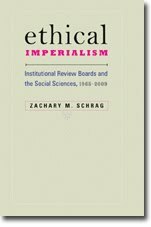 Here an IRB has forced a historian to violate her professional ethics.